If you don’t travel much, but you were among the millions of Americans who set out to visit loved ones this past Thanksgiving weekend, the traffic nightmare you experienced was indeed an anomaly. Just to be clear, traffic on the Washington Beltway isn’t always a nonstop horror show. The Delaware Memorial Bridge is not permanently closed. And traffic on the 405 tends not to be so epic (see “Favorite Tweet”). 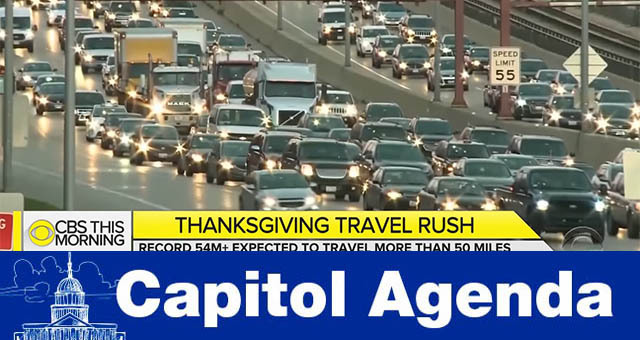 Ironically, though, while the Turkey Day travel phenomena has become depressingly awful, congestion during the rest of the year is, at best, intolerable. How bad is it, you may ask? Well, to put it this way, in most cities walking will get where you want to go faster than the bus or an Uber. And, since your neighbors are addicted to Amazon Prime, more trucks and large vans are out and about making deliveries in our towns and neighborhoods. This ever-increasing demand for capacity is straining our freight and commuter corridors, and slowing us up every year (think bumper-to-bumper traffic caused by roadway construction). This congestion also comes at a real cost. Besides eating away precious time you and I could be spending at the gym or binge watching The Romanoffs (second Amazon reference), highway congestion hit the trucking industry with $74.5 billion in operational costs in 2016, according to a study by the American Transportation Research Institute. Other modes also experience massive operational costs. Local, state and regional policymakers already have been responding to this congestion crisis. More than half of state governments, for instance, recently approved increases in fuel taxes to come up with more money to fix and modernize roadways, bridges and tunnels. Other states, such as Oregon, are testing alternative sources of funding to pay for infrastructure maintenance and road repairs. On Nov. 28, transportation policymakers in the U.S. Senate will host the rare lame duck hearing to examine the country’s “Surface Transportation Infrastructure Needs.” Witnesses scheduled at this hearing include Carlos Braceras, the new president of the American Association of State Highway and Transportation Officials; Bob Lanham, vice president at Associated General Contractors of America; and James Corless, executive director of the Sacramento Area Council of Governments. Nov. 29, 9:30 a.m.: Senate Environment and Public Works Committee meets to review existing concerns about surface transportation. Nov. 27, 8 a.m.: Roll Call holds a discussion on “Election Impact: Tax Policy in 2019.” Sen. Chris Van Hollen (D-Md.) joins the conversation. Nov. 27-28, 9 a.m.: PlanGrid hosts its 2018 Public-Private Partnerships federal conference, Nov. 27-28. Speakers include Australian Ambassador to the U.S. Joe Hockey; Jim Gebhardt, senior finance adviser at U.S. EPA; and Dinesh Mehta, manager of the Energy Department Loan Programs Office. Nov. 27, 1:30 p.m.: The Atlantic Council’s Latin America Center and Politico host an event titled, “The United States-Mexico-Canada Agreement (USMCA) Signing: The Implications for Consumers and the Road Ahead for Congress.” Speakers include Agriculture Undersecretary for Trade and Foreign Agricultural Affairs Ted McKinney. Nov. 28, 9 a.m.: The Washington Post hosts a sit down with acting EPA Administrator Andrew Wheeler. Nov 28-29, 9 a.m.: The American Public Transportation Association hosts the 2018 Industry Leadership Summit. Nov. 28, 5 p.m.: The National Park Service hosts the 96th annual National Christmas Tree Lighting. Nov. 29, 9 a.m.: The Washington Post hosts a sit down with House Speaker Paul Ryan (R-Wis.). Nov. 29, 9:30 a.m.: The Brookings Institution examines the midterm elections and tax policy. WINTER WONDERLAND: When winter weather arrives, what also comes with it is the use of road salt, which exacerbates truck corrosion. SALT LIFE: September and October were record months for many of the nation’s ports as shippers prepared for a busy holiday shopping season and rushed to get cargo into the United States ahead of the Trump administration’s tariffs against several nations, including China. BELOW AVERAGE: Pennsylvania has again earned a C- on the American Society of Civil Engineers’ infrastructure report card. Public transit programs and proposals will be among the top issues Democrats on the transportation policy committees will look to examine when the next Congress begins in January, sources tell Transport Topics. Rep. Peter DeFazio gets Q&A’ed. I don’t want people to think that the first day I walk in there, we’re going to have 38 subpoenas going out the door. Rep. Elijah Cummings (D-Md. ), on Meet The Press Nov. 25.